With the "dog days" of summer coming to a close as we head into the back-end stretch of the MLB season, the Red Sox are showing no signs of slowing down. Currently, the Sox are in first place in the American League East by 5.5 games over the New York Yankees and have the best record in baseball, sitting at an impressive 75-34, a whopping 41 games over .500. The upcoming series against the Yankees is arguably one of the most important of the season, as the Sox could pull further ahead in the AL East, paving the way for the Hunt for Red October and another World Series ring. Enjoy a cold Sam Adams Summer Draft and Basket of Wings During the Games for only $11! But, that's not the best part, you will even get to take home a limited edition Sam Adams/ Red Sox Pint Glass! 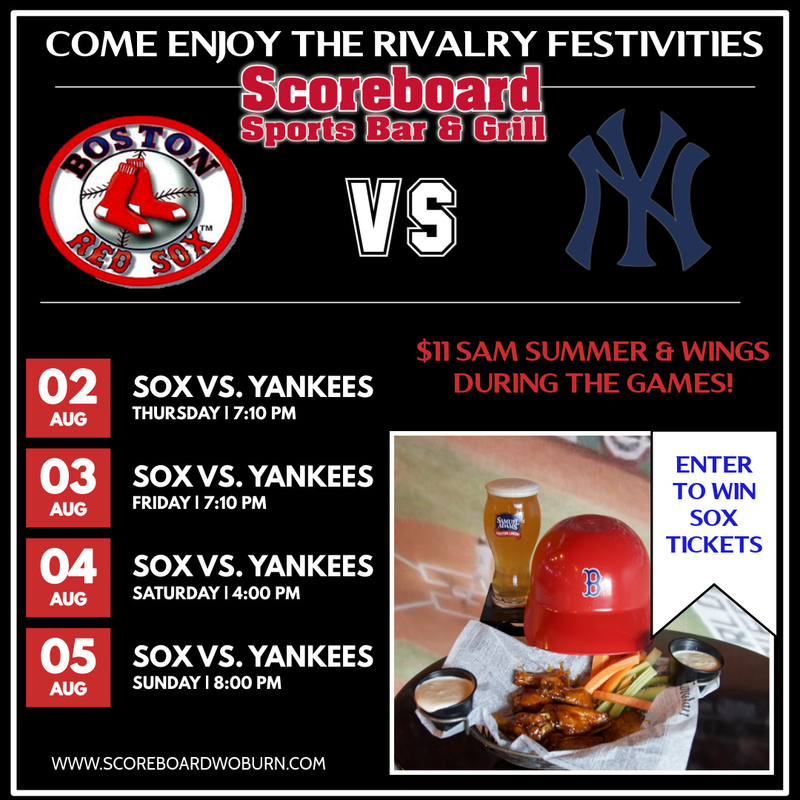 It gets better, you will also be AUTOMATICALLY entered to win Red Sox tickets, and all you had to do was drink beer and eat wings, sounds like a home run to us! Special is valid all season long, but our last pair of Sox tickets to giveaway ends on August 31st so join us for every game this month and you could win! As for our Boston boys, we interviewed our very own bartender and self proclaimed "Red Sox Expert" Nick, his Sox Synopsis is below. Want to chat baseball? Find Nick or Billy on the bar, grab a cold beer, pull up a seat and dish out your thoughts, you're in good company here! Despite Chris Sale recently being put on the 10-day disabled list due to shoulder inflammation, he leads the league in strikeouts (207) and ERA (2.04), dominating the mound every time he gets the nod. Craig Kimbrel sits in second place in the American League in saves, boasting a total of 33. Rick Porcello is tied for second place with wins (13) and David Price continues to grind and provide quality starts for the Sox. Nathan Eovaldi, the most recent addition to the Red Sox pitching staff from a trade with the Tampa Bay Rays, shined in his first Sox appearance, throwing 7 innings of shutout ball, with 4 hits and 5 strikeouts. The middle relievers have made Sox fans weary, however if the starting pitching staff can provide quality starts as they have been and the offense stays hot, the Sox could potentially surpass the regular season record for wins at 116. We are your Boston Red-Sox Headquarters for every minute of baseball action & you know we'll throw one amazing party if & when the Sox win another ring!